Space Systems/Loral (SS/L) is designing and building a series of five meteorological and environmental satellites to provide scientists with vital data to forecast weather, identify and track severe local storm conditions, gather data for meteorological research, monitor solar activity, and relay signals from ships and aircraft in distress. Named GOES (Geostationary Operational Environmental Satellite) I through M, the spacecraft are being built for NASA, as manager of the program for NOAA. The first GOES was launched in 1994 aboard an Atlas-1, the last was launched in 2001 on an Atlas-2A. The launches are staggered to keep two operational satellites on orbit at all times. Three satellites are already on station, delivering data of such high quality that it has surprised and gratified the scientists that depend on its information. They provide 24-hour monitoring and measurement of dynamic weather events in real-time, and are the first to deliver simultaneous independent imaging and sounding from geostationary orbit. GOES provides the extremely accurate image navigation capability (within 2.1 miles) necessary to successfully track local area severe storms. Over the course of the contract, signed in late 1985, many design improvements have been made to improve spacecraft performance and to allow an increase in size. Such efforts continue. New instrumentation has been developed and added to the payload. On-board instruments include a new-generation Imager that operates in both visible and infrared spectra, and a Sounder which continuously measures vertical temperature profiles. The Space Environment Monitor includes a magnetometer, energetic-particle sensor, highenergy proton and alpha-particle detector, and a solar X-ray sensor. The X-ray sensor regularly monitors solar flare activity that could cause high-level electron bombard-ment of people in space and satellites, affect the weather, and cause static. The GOES spacecraft is based on SS/L's three-axis, bodystabilized FS-1300 bus. 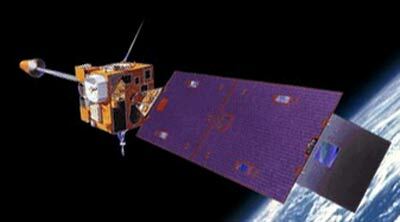 GOES 9 failed in 1998 due to momentum wheel problems.